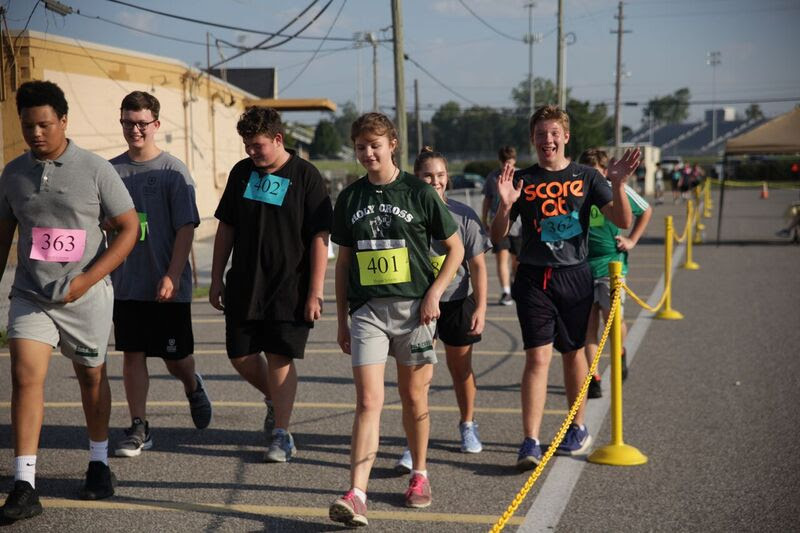 The Crusader Run was a success! The students did really well in spite of the very hot conditions. Thank-you to all of the parents who volunteered to help with the event and also to the parents who donated items for the students. A big THANK YOU to our sponsors! W.C. Borchelt & Sons, Jeff & Kim Milleman, David L. Wade & Associates P.C., Tim Metel CPA & Associates, Fred Toenges Shoes & Pedorthics and Paul Davis Restoration & Remodeling. Thank you to Lesa Van Meter of Shadowland Photography for spending the day taking pictures! The money and pledge sheets are due Friday, October 6th. We will take them after that date but they will not count towards the prize totals. Please include the money with the pledge sheets. If there is an online donation please note that on the pledge sheet. The elementary class that raises the most money will be treated to a pizza party! Also a reminder to the middle school students that we are looking forward to finding out the winner of the boys vs girls competition! The team that raises the most money will receive a pizza party and the top two fundraisers of that team will get to throw the pies. If the boys win, Jen and Tama get a pie in the face, if the girls win Phil and Chad get a pie in the face. Collect those pledges! !